AUDEMARS PIGUET - ROYAL OAK OFFSHORE - Is considered to be the most "Heavyweight" King of all chronograph watches ever created for any given year and it will continue so perhaps always..
Add on top of that this particular model has most sought after "PANDA" dial. 42mm Stainless steel monobloc case, octagonal bezel, with integrated bracelet(metal band). Silver mega tapisserie dial, with black chrono registers and red stop watch Tachymeter. 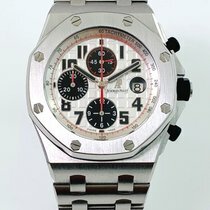 AP - a truly unique watch manufacture. It is one of the few global haute horology brands that remains in the hands of its founding family.